It’s reveal day peeps! Have you been waiting for this? 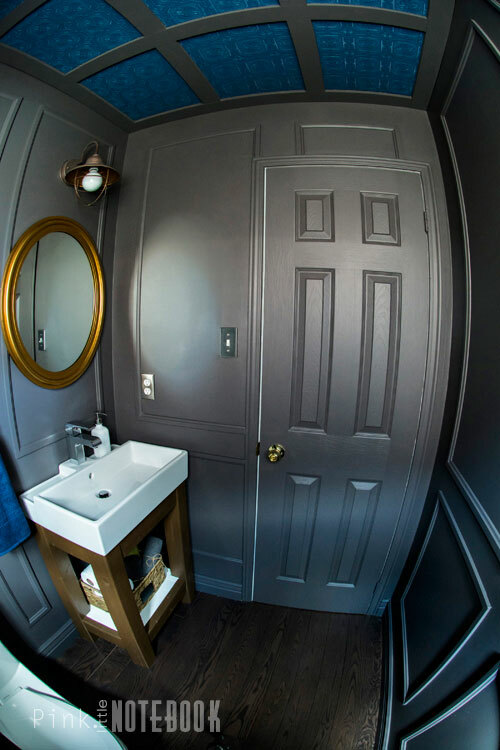 Over the last few weeks, we performed some major surgery on this dated powder room and it’s not until I create these posts that I’m reminded of what we’ve started with. . . If there’s one thing you should know about me—I LOVE to experiment with style. I really do use my home as a personal canvas. I know there’s always going to be a better way to do things or better materials to use but reality is we try to make due with what we have. We didn’t have a large budget dedicated to this space. 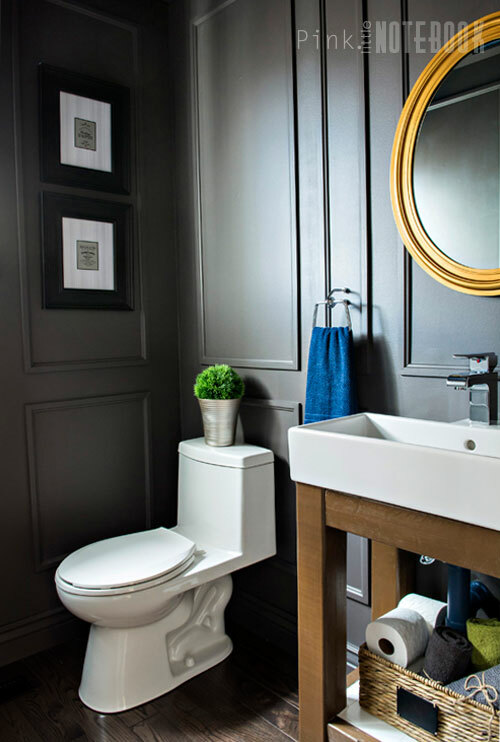 However, it didn’t stop us from creating a stylish powder room with huge impact—thanks to a bunch of DIY projects, bold colours and left over materials. 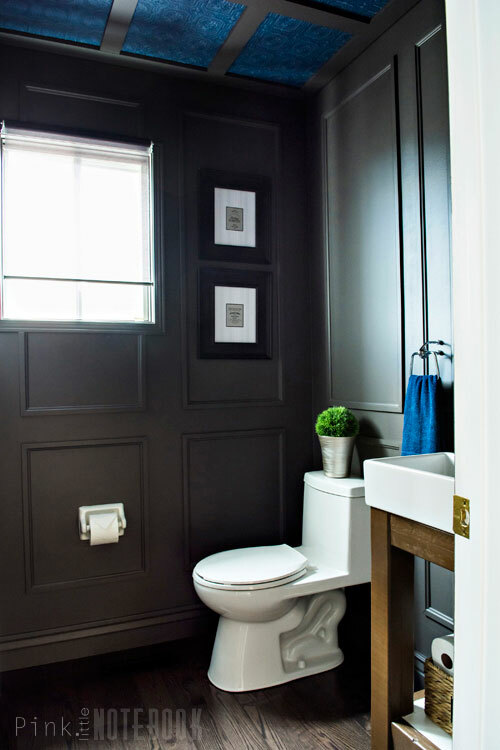 When it came to this powder room, I wanted to create an inviting space that provides a ton of visual interest. Colour plays such a crucial role in creating a room’s desired mood. 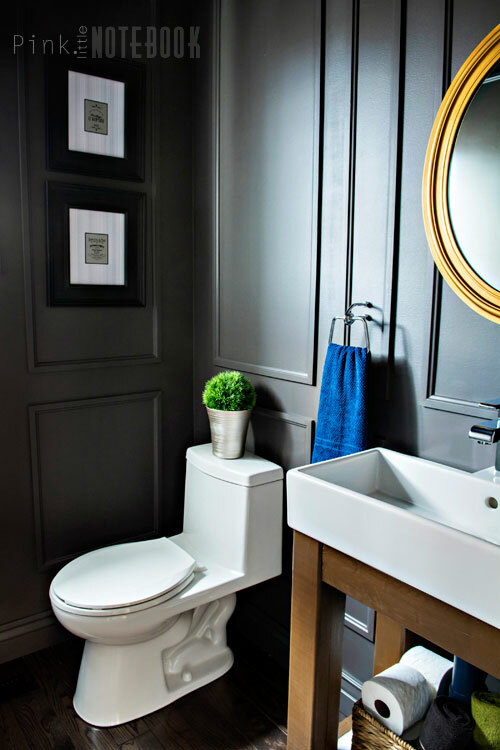 Using a dark hue on the walls + trim for a monochromatic look helps set the intimate feeling of this space (Brush Nickel, P5244-62, PARA Paints). 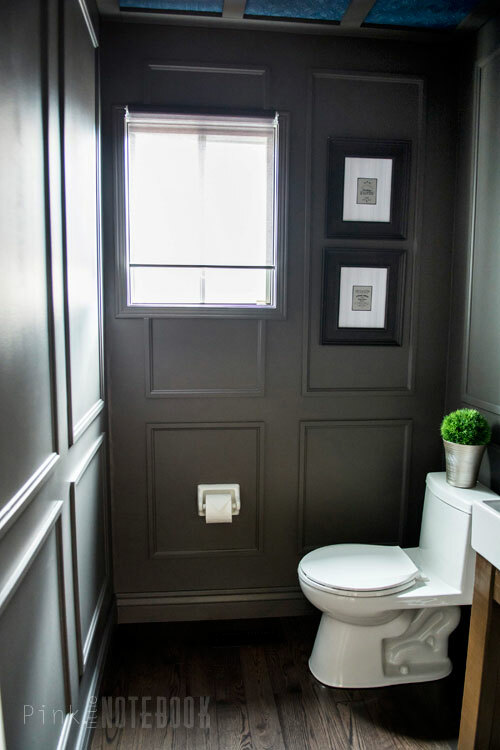 One of my favourite DIY projects is the architectural details we added to the walls. Finding alternative uses for leftover shoe molding we had in our house not only saved us $$ but created a striking feature throughout the room. The tile floor was replaced with extra hardwood we had on hand. With pre-cut lumber from Home Depot and the IKEA LILLÅNGEN single bowl, we created a simple DIY vanity project that allowed us to customize our sink to our space. Not only did we add a larger sink surface but we created storage too. A simple basket placed on the open shelf is used to store extra toiletries for our guests. Affordable and stylish lighting options are so hard to find these days. I scored another Hampton Bay light fixture at Home Depot. It’s actually an exterior light that I found for $35. I altered the original look of this fixture by removing the glass globe that sits within the steel housing. I just love the charm of this lantern-style light! I purchased a mirror that I didn’t end up using in this space. In fact, I ended up finding an old mirror in my mother’s house that fit the space much better. Like any good daughter would do, I convinced her to swap mirrors with me—new mirror for her old one. I’m loving the oval shape and copper colour. It mimics the interior finish of the light fixture perfectly. 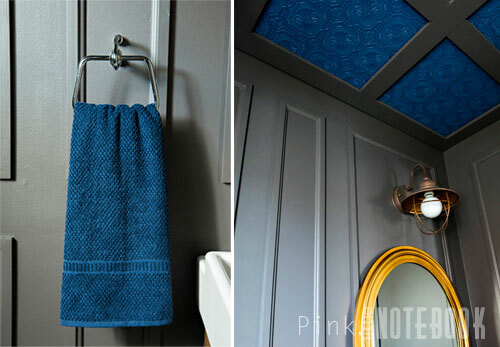 The ceiling is the showstopper of this powder room. It’s an element of surprise that draws the eye right up. Although, the deep blue paint (Beyond the Sea, P5155-73, PARA Paints) was an after thought, I’m glad I went through with it. I love how it brings out the details in the textured wallpaper. We used MDF strapping painted in the same colour as the walls to balance the bold ceiling. The best part—you can get this look for under $40! I will be sharing all my DIY details in an upcoming post. We are thrilled that this space is officially done. Another one down, several more to go! 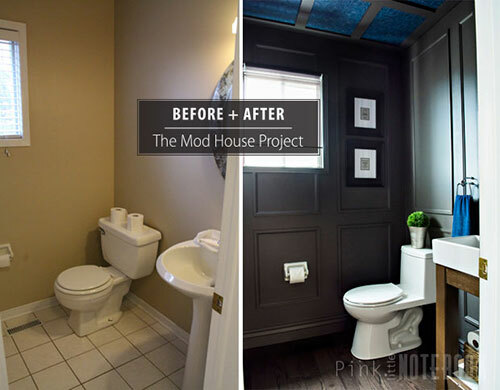 Disclosure: I’m thrilled to have the opportunity to work with Home Depot Canada in this powder room makeover. I was provided with a gift card in order to purchase some supplies and products for this space. All views, opinions and creativity are my own! WOW WOW WOW! That is amazing! I love what you did! This looks amazing! I was looking forward to seeing the final result, and you did not disappoint. What a transformation. 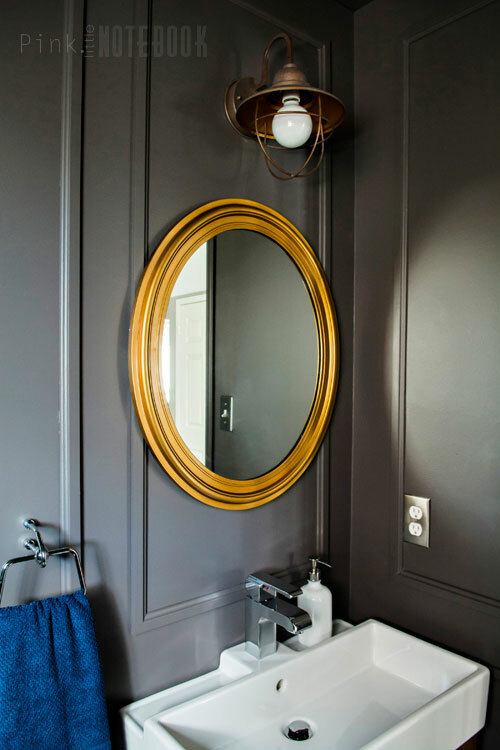 I love the wall treatments and the dark paint. So dramatic. Also, what a difference the photography makes. It’s nice to see the whole space in one picture to see how everything works together. wow I absolutely love it! I dont know why people always say dont use dark colours in small rooms- it is so dramatic! Tell me about it! My mom who is the biggest critic about using dark colours in a small space actually walked in my powder room and said it looks 10x bigger than what you started with. Oddly enough, the dark colours and molding made my 8 ft ceiling look like their 10ft high! I felt as if I were gazing into House Beautiful or Fanciful Interiors!! That is most beautiful and inspirational!! Wow! What an amazing transformation. The new look is so luxurious! I love those walls and the contrast of your brassy accents – great job! Amazing…as usual. I really love the blue ceiling and yellow mirror. Well done! Absolutely Stunning!!!!!! I love the walls. Wow Sabrina it’s fabulous! Way to be bold in a small space! I love the mouldings on the wall. Fantastic job! I really love your creativity and ingenuity – I think the light fixture is one of my favourite take-aways, and I am blown away by the walls. What a difference!! Oh, so gorgeous Sabrina! Love, love it. So rich, warm and total wow factor. Great job! Just stunning, Sabrina! I love all the paneling! omg what a BEAUTIFUL JOB!!! I am blown away by the moldings. my guest bath is basically the same as yours and I think I might steal some ideas!! This looks fantastic Sabrina!! 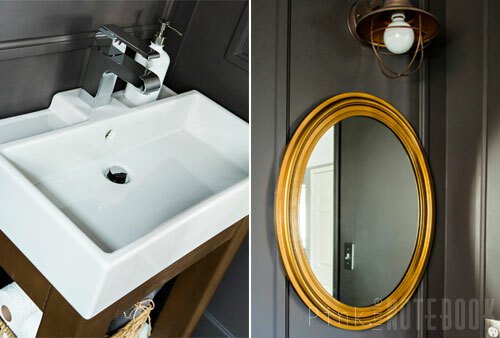 I love love love the dark walls with the molding and your DIY sink. The bathroom looks gorgeous! Oh my gosh that doesn’t look like the same room! You’ve really done a wonderful job, it’s gorgeous! It gives just the perfect amount a light for my small space, however, I had to put in a bright light bulb. With that being said, I probably wouldn’t change three lights for one. It definitely will not give you the same amount of light. Good luck! Beautiful!!! Have used the wallpaper on my studio ceiling…the painting is tough getting all the nooks and crannies on 660 medallions! Your make over has inspired me…thank you! that is awesome, i love the wall treatment and the gold mirror. and the toilet. Love the architectural molding! It brought so much dimension and impact to this space. Great job! The bathroom looks great! I especially love the details of the walls. I love the sink too. Anything from Ikea is great. I just love this! You would think black in a small place would be too much but it’s perfect! I really think you have a LOT of talent and holy cow this is AMAZING! I have not really wanted to paint anything in a while.. I saw this on hometalk and had to come get more information. Beautiful work, I plan on copying! Small powder room with a blue cultured marble top. 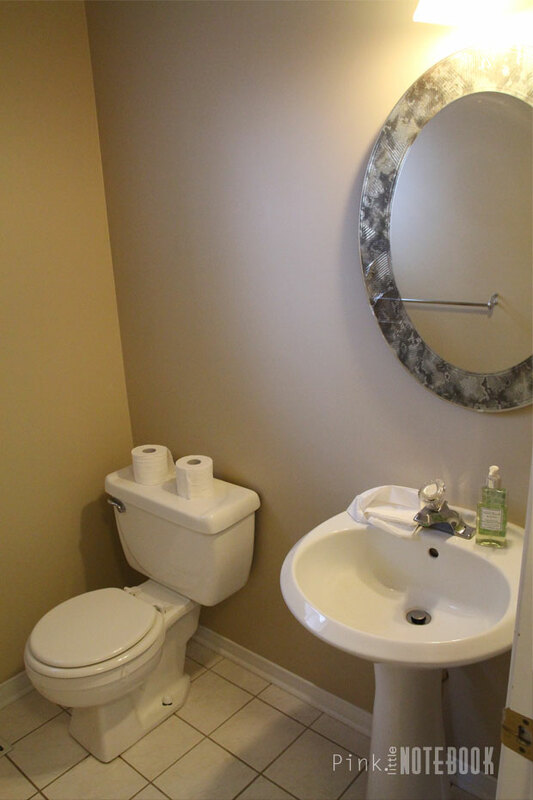 toilet is white, walls are white .Dk Hardwood floors. What color would you paint the walls ? Hi Eileen! If your countertop is a bold blue, I would leave the walls white and get a couple large pieces of art work that have an array of colours in them (make sure the blue from your countertop is incorporated in it). Also this allows you to pull other colours from the art work into your accessories 🙂 It will give you a bright fresh space and make your blue marble top blend in. What a transformation! I love it a lot! Your blog will now be part of my regular sites to visit. Wow. You gave this space character! Wish you could do my little bath. While it is a full 3 piece bathroom it is small. Black and white old fashioned tile floors.. All walls are half wall white tile with black border. No storage at all. Tired of everyone saying just paint it light blue gray. Any advise? I just have to say that I believe you are way beyond awesome. This is an amazing project that shows how a person with a modest budget can achieve great style. Love your makeover, it looks so elegant now! !